Connects a displayport equipped PC to a monitor. Premium cable for transferring high-bandwidth, uncompressed digital video, multi-channel digital audio and control functions. 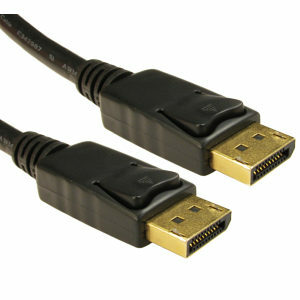 Our 2m DisplayPort cable features the latest generation of licence free digital connector designed primarily for connections between a computer, display monitor or next generation tv. The displayport connector has 20 pins and slightly larger and more rectangular than HDMI.